Ever wondered how movies and TV shows look so polished? Sure, some of it has to do with the type of camera used and how it’s supported and moved, but that’s hardly the only thing. In fact, the final footage you see on your screen or in a movie theater looks a lot different than what came out of the camera. This is due to the process of color grading, and it can work for you just as well as it works for Hollywood, thanks to DaVinci Resolve from Blackmagic Design, an industry-standard coloring software that’s available or free. We don’t mean “free for 30 days” or “free with purchase of something else.” We mean free. Period. Anyone can go download and install the latest version of DaVinci Resolve right now and begin using it. DaVinci Resolve combines world-class color grading with a fully functional NLE and it’s completely free. You might be wondering if there’s a catch. There isn’t. DaVinci Resolve is the program of choice for professional colorists working on everything from low-budget indie films to television commercials and Hollywood blockbusters. With the latest version, Resolve has even grown into a full, non-linear editor (NLE) to rival Apple Final Cut Pro X and Adobe Premiere Pro (although, it still plays nicely as a companion to those programs, too). Whether you’re a film student, a YouTuber, or an experienced editor who just hasn’t tried it yet, Resolve is a great tool to know. It can bump up your production value without adding any costs. It will also prepare you for working in a professional postproduction environment, if such a thing is in your future. Resolve is a powerful program that may be overkill for casual users, but it’s worth checking out even if you just want to make basic color corrections without getting into the nuance and artistry of true color grading. So, here’s what you need to know in order to get started. DaVinci Resolve is available for both MacOS and Windows PCs. As a memory and graphics-intensive application, Resolve will consume however many resources you can throw at it. Blackmagic Design recommends at least 16GB of RAM, although the program will run on just 8GB. 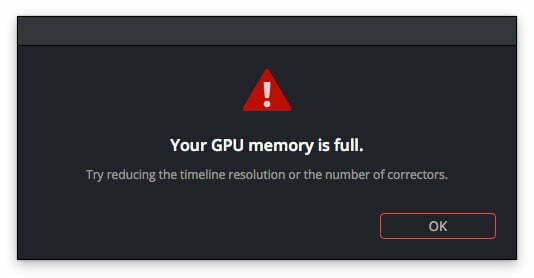 Graphics card requirements are not explicitly spelled out, but obviously newer cards with more VRAM will perform better. Mac users with Nvidia cards should check the CUDA control panel in System Preferences to make sure they’re running the latest driver. You can find more information here. Other than that, you just need some footage to work with. Resolve is designed to handle professional video formats, like various RAW formats and Apple ProRes, which will give you more latitude for adjustments than the highly compressed formats that come out of consumer cameras. This is where 10-bit versus 8-bit color and 4:2:2 versus 4:2:0 chroma subsampling come in –if those terms are new or confusing, you should definitely watch this great explainer. You don’t need a professional video camera to get started with Resolve. You should, however, set your camera up to shoot as “flat” as possible. By default, cameras like to make video look punchy by increasing contrast, but this throws away detail in the highlights and shadows. Set your camera to its most neutral profile, which is often simply called “neutral” but may be “natural” or something similar. The idea here is to record as much information in the shadows and highlights as possible, so that you have a better starting point in Resolve. Some cameras will even have a profile labeled “flat,” which is designed specifically for giving you more latitude in postproduction. High-end cinema cameras, and even some consumer cameras like Sony’s A6300 and A7S II, have what’s called a Log profile, which is even flatter than “flat.” If your camera offers this option, don’t be afraid to use it – just know that your footage is going to look really dull until you take it into Resolve and punch it up. DaVinci Resolve is broken in to four main workspaces, accessible via tabs at the bottom of the screen. There’s Media, Edit, Color, and Deliver. We’re going to be talking mainly about the Color workspace. If you’ve spent much time in a professional-level NLE before, Resolve will look somewhat familiar to you, but there are many aspects that will be new. The Nodes window, for example, may look confusing at first, but it’s only as complex as you make it. It’s also one of Resolve’s key strengths. 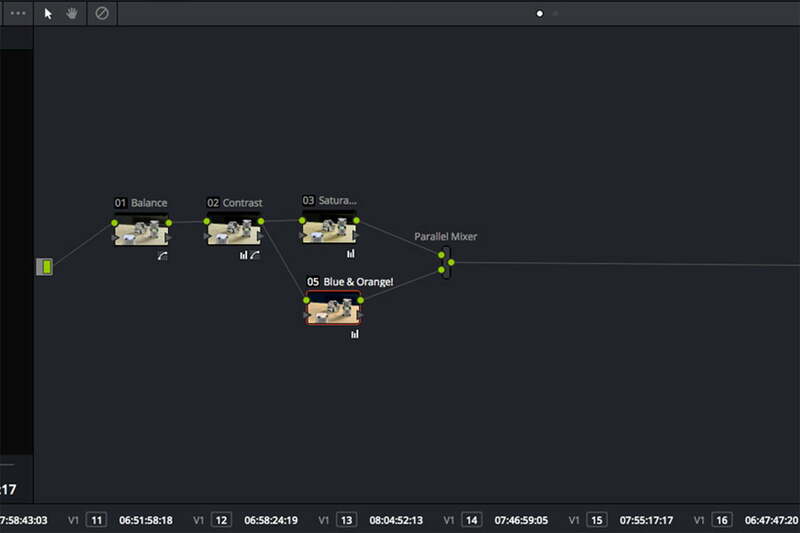 At their most basic, nodes are used to separate different steps in the color grading process. So, you could start by correcting contrast and saturation on the base node, then add a new node to perform a white balance adjustment. A third node could introduce a stylistic colorcast into the highlights, while a fourth could be masked to increase saturation on a specific element in the frame. Nodes get much more advanced than this, but using them to separate stages in your coloring workflow is a good place to start. If you’re new to color grading or are coming from the still photo world, Resolve can display exposure and color data in a few ways that may be unfamiliar. In the video scopes area, you have a choice of several different visualizations, but there’s one that should become your best friend: the RGB parade. Resolve now includes features familiar to still photographers, like color temperature and tint sliders. You can turn on video scopes from the toolbar below the timeline on the right side of the screen. The RGB parade is similar to an RGB histogram, splitting exposure data into red, green, and blue channels so you can judge color balance in addition to exposure. Unlike a histogram, however, the parade puts highlights at the top and shadows at the bottom, while the horizontal axis corresponds to the video frame itself. So, if there’s a bright white object at the center of your frame, then the RGB parade will spike top and center. You’ll want to keep an eye on the RGB parade as you begin your initial color correction. It provides exposure, color balance, and contrast information, so it’s a very helpful tool. If all channels are lined up with each other, then you probably have a balanced shot. If, say, the blue channel is registering brighter highlights than the red and green, then your white balance may be off. Keep in mind that the RGB parade doesn’t know the subject matter of your shot, so you have to use it in conjunction with your understanding of what the colors should be in order to get a correct result. A scene with a lot of sky in it will naturally register more in the blue channel. If there are any clouds, however, there should still be points in the highlights where all three channels match up, indicating white.